On March 12, 1929, Margaret Bowen, a worker at American Glanzstoff, led a walkout of 523 women operatives. After other shifts joined the walkout the next day, the plant closed on March 14. Four days later Bemberg workers struck in sympathy with the Glanzstoff operatives. The workers' protests centered on low wages, unfair promotion policies, and petty regulations that applied only to females. Workers also objected to the pressure exerted to force them to rent houses at high rates from Watauga Development Corporation. At the time of the strike, Glanzstoff employed 1,099 men and 854 women, while Bemberg employed 886 men and 384 women. At Glanzstoff, although all employees had a fifty-six-hour week, wages for women were considerably lower than those for men. When the strike began, there was no active union local at the plants. Local 1630 of the United Textile Workers Union of America (UTW) had been chartered in November 1927, when Bemberg workers struck for increased wages, and workers reactivated Local 1630 at a March 13 meeting. Dr. Arthur Mothwurf, president of the rayon plants, refused to recognize the union and refused to consider wage increases. At Mothwurf's request, the Carter County Chancery Court enjoined strikers from picketing, damaging plant property, interfering with plant workers, or assembling at the plant gates. Another injunction prohibited strike activities on roads near the plants. Workers refused to end their strike, however. Charles Wood, a Department of Labor Conciliation Service mediator, and Paul Aymon of the Tennessee Federation of Labor arranged a meeting between Mothwurf and labor representatives. They reached an agreement which provided for wage increases, assurances for strikers against discrimination, lifting of the injunctions, and recognition of an in-plant grievance committee. There was no union recognition. Initially Mothwurf refused to sign the agreement, but three days later he pledged his support, and the plants reopened on March 26. Yet management refused to hire back strikers and UTW members. William Green, president of the American Federation of Labor (AFL), sent Edward F. McGrady, the AFL's Washington, D.C., legislative representative, to investigate. McGrady reported that over 300 union members had not been rehired. Early in April, a group of prominent Elizabethton businessmen kidnapped McGrady and Alfred Hoffman, a hosiery union official. They were driven across state lines in separate cars, released, and warned not to return. When they returned, 4,000 workers rallied in outrage at the kidnappings. Workers sift through rubble of house destroyed by dynamite. On April 13 and 14, management dismissed union members of two Bemberg grievance committees. These dismissals led directly to the second strike, which began on April 15. This time the UTW participated from the start. On April 20, Governor Henry Horton appointed George L. Berry, president of the International Printing Pressmen's Union, to act as the governor's mediator. But Mothwurf refused to meet with Berry, who then resigned on May 8. During the second strike, Dr. S. C. Rhea, an employee in the Bemberg Chemical Department, organized the "Loyal Workers of Bemberg," which soon included Glanzstoff as well. Rhea claimed to have the signatures of 700 loyal workers. Mothwurf reopened the plants on May 6. The number of returning union members is not known. The union counted only a few, but management claimed more than 1,100 employees at work on May 11. Management admitted, however, that 500 were "new hires," or strikebreakers. 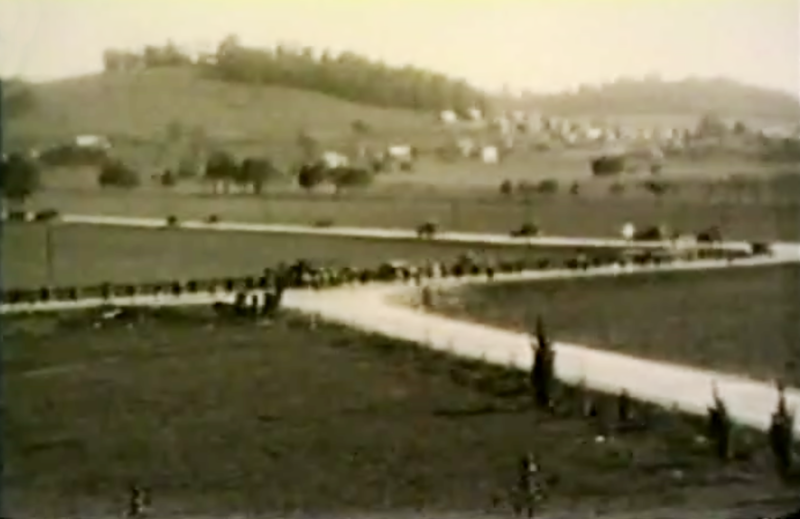 With the reopening of the plant, Mothwurf persuaded Governor Horton to dispatch 800 National Guardsmen to Elizabethton, an action that turned the strike into a violent, bitter affair. Increasingly violent encounters between strikers and soldiers occurred along the roads leading to the plants. Troops used tear gas against strikers, and in one three-day stretch, from May 14 through May 16, they arrested over 300 strikers. Two houses were dynamited; two barns, one containing plant machinery, were burned. On May 16, a water main leading into Elizabethton was dynamited. The violence resulted in a deluge of requests from labor and other sources to Governor Horton demanding the removal of the troops from the city; Horton refused. On May 23 Mothwurf and a second mediator, Anna Weinstock, reached an agreement which stipulated that the plants would reinstate former employees, would not discriminate against union members, and would recognize worker grievance committees. Local 1630 was not accorded recognition. The plants brought in E. T. Willson, an antiunion personnel manager from New Jersey, to carry out investigations of striking workers who had not been rehired. On May 25, 2,500 workers grudgingly approved the agreement. The strikes cost the plants an estimated five hundred thousand dollars in losses. In July 1929 Mothwurf left for a two-month vacation in Germany and did not return. The issue of discrimination against union workers continued to plague the plants. By his own account, E. T. Willson blacklisted between 200 and 300 workers. Strikes over this issue occurred in June and October 1929 and March 1930; workers called off a threatened strike in September 1929. Most blacklisted workers were never rehired. The companies never recognized Local 1630. Instead, they created the Bemberg-Glanzstoff Council, which controlled labor concerns until 1938. The local briefly affiliated with the CIO's Textile Workers Organizing Committee when it took over UTW locals. After the UTW was reconstituted in 1939, a National Labor Relation Board election recertified the local as a UTW local in 1940. The legacy of the 1929 strikes is multifaceted. As a consequence of Local 1630's defeat and the treatment of the workers, bitterness and mistrust have marked labor-management relations to the present. The violence of the strikes, however, generated union opposition among many workers; as the union weakened, workers dismissed it as useless. Company officials promoted their union and sponsored plant activities in the 1930s in an effort to establish a reputation as "good" employers. To an extent, they succeeded and solidified their place as the city's most important employers. A number of sources credit the Elizabethton strikes as the initiators of a wave of strikes that swept across the Piedmont textile industry in 1929 and 1930, although their exact role remains a much debated subject among southern labor historians.